OK, new rule: No one is allowed to say the words “poop” or “sleep” around me right now. ‘Cuz those are my buzzwords, and I might just flip out. Ninja style. It’s easy to see from my “new rule” that I may be in a little over my head right now. But that’s alright, because someday my kids will be grown and gone away, and I will want it all back. I will long for the days where they shat upon me, shouted in my face, tried to kill one another, (and me), and took turns throwing all-night ragers at the P-Patch. As I take it in stride; in a rare moment of clarity, I see it all happening amidst them settling into my lap for the BEST snuggle/hug/kiss that anyone ever gave. All for me. So there’s that. Life is funny like that, right? 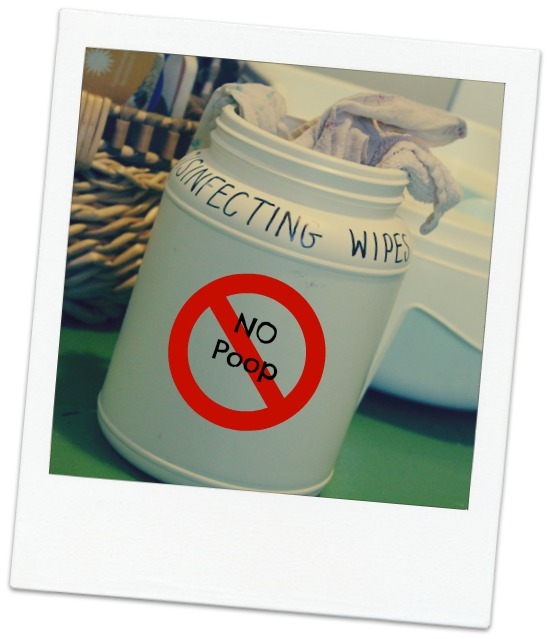 We keep it chemical-free around here as much as possible, and I wanted to make a natural and reusable alternative to Lysol wipes. Of course, my trusted vinegar/water spray bottle and microfiber cloth are my first choice, but I also wanted something quicker. 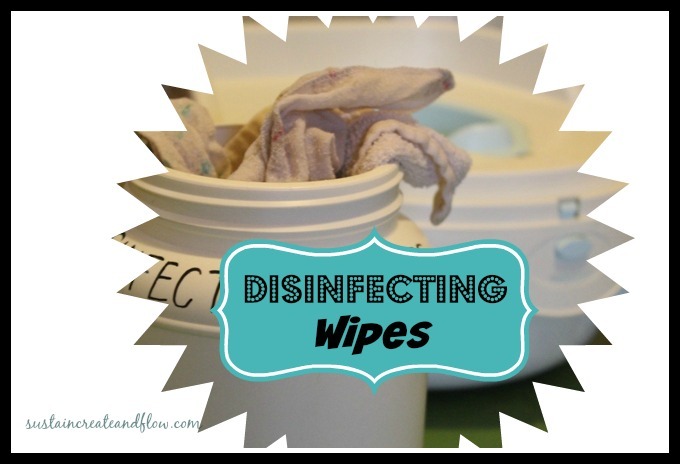 These homemade disinfecting wipes are easy to make. (I whipped them up in desperation) and you probably have most of the stuff lying around already. I used rubbing alcohol, filtered water, a little castile soap, essential oils, and a tad bit of glycerin for a little extra slip and to emulsify the oils slightly. I mixed everything together in a cup and poured it over scraps of cloth. I stored it all in a large old coconut oil container I’d been saving. I already had some old pieces of flannel that were retired cloth baby wipes so that portion was easy for me, but old t-shirts, rags, whatever you’ve got will work great. Combine all ingredients in a cup or jar and pour over your scraps of cloth. Store in a tightly sealed container. 4 bandits, during the 17th century plague in France, robbed plague victims without getting infected. After their arrest, they were offered leniency by the magistrate if they would divulge their secret; the blend that protected them from the Black Plague. Also known as Thieves Vinegar or Marseille Vinegar throughout the ages, their notorious oil blend has gone through plenty of transmutations. Yes. Or vodka, or perfumery alcohol would even be fine. Whatever you’ve got. I used rubbing alcohol.